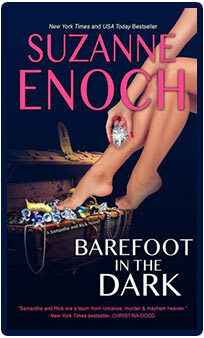 A simple pre-wedding getaway for a “reformed” cat burglar and her wealthy British fiancé – what could go wrong? Except for his contentious family, a crumbling Scottish castle, a legendary treasure, and a possible haunting, that is. Samantha Jellicoe, jewel thief extraordinaire, is still adjusting to being engaged to Richard Addison, billionaire entrepreneur and very hot British lord. Complicating that is the entire press corps hounding her for an interview – bad news for a mostly retired cat burglar intent on keeping her private life private. She is ecstatic when Rick suggests they escape to his castle in Scotland; she’s less so when the old pile turns out to be dilapidated, full of Rick’s resentful relatives, and (possibly) haunted. While he navigates the consequences of ignoring his family for the past fifteen years, Sam uncovers a legend of buried treasure – and realizes she isn’t the only one searching for the famous highwayman’s loot. While Sam is an expert at blending into the very different worlds of patrons and thieves, meeting people important to Rick is way more complicated. Combined with iffy phones, unreliable lights and power, a clandestine treasure hunt, a wannabe reality-star girlfriend, and a rumored “restless spirit,” this vacation in the Scottish Highlands might be more than a self-respecting former thief can handle.